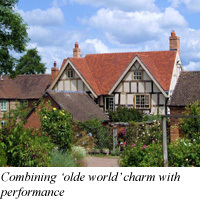 As one of Britain’s foremost independent handmade roof tile manufacturers, Tudor Roof Tile Co Ltd combines the finest English natural clays with traditional skills and methods, to create old styled plain tiles with much sought after aesthetic qualities. 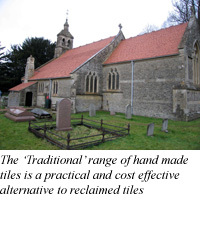 Now one of the few remaining Kent Peg clay tile manufacturers, the company is still located on the Romney Marsh, where craftsmen continue the age old tradition of the hand made clay tiles of Kent. The range includes ‘Traditional’ nibbed plain tiles, with their large degree of double camber and subtle variation in shape and colour plus the ‘Conservation’ range of Peg and Oast tiles, which has a less pronounced camber, in the style of the original Kent Peg Tiles. All are available in five traditional mellow tones: Medium Antique, Dark Antique and Red Antique plus the classic Sussex colours of Red and Brown. Recent additions to the range include authentic handmade creasing tiles and unique bat access tiles, designed to help preserve Britain’s endangered bat population, plus the newly launched ‘Jubilee’ range of peg and plain tiles. Combining age old craftsmanship with modern performance benefits, Tudor’s range of roof tiles and accessories are carefully hand pressed, moulded and trimmed, and then strengthened by advanced energy efficient firing techniques, to give the final products exceptional durability. All Tudor roof tiles are made in accordance with BS EN ISO 9001:2000, and to standards BS EN 538:1994 for strength plus BS EN 539-2:1998 for frost resistance. Therefore, unlike second hand and reclaimed tiles, which can be costly, and prone to rapid deterioration and breakage when re-used, Tudor’s roof tiles are guaranteed to perform well for many years to come. The ‘Jubilee’ is the first of a new generation of clay peg and plain tiles featuring a distinctive blending of face colouring. The rich earthy face colour has a random darker staining, which is hand applied and kiln burnt to recreate the ‘instant aged’ and time-weathered appearance of a mature and seasoned roof. Launched to mark the company’s 25th anniversary of manufacturing in Kent, the variable tones, texture and camber of this attractive twice sand faced plain tile emulates the historic handmade tiles of yesteryear, making it a natural choice across a wide spectrum of new build, restoration and heritage projects. 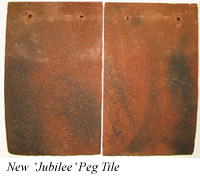 A reliable, cost effective and practical alternative to second hand reclaimed tiles, the Jubilee is available with standard nibs or alternatively with square (or round) peg holes for use on conservation projects. Additional bespoke colour blends from Tudor’s range of natural clay colours are also available to order. Tudor’s ‘Traditional’ range of hand made ‘nibbed’ plain tiles and ancillary fittings are a high quality, authentic and cost effective alternative to sourcing expensive second hand and reclaimed tiles. Builders and architects are now increasingly specifying these ‘Traditional’ sand faced clay tiles, as they create aesthetically appealing textured roofs, which enhance and add value to new build projects as well as complementing older styled properties in areas of historical sensitivity. With their double camber and subtle variations in shape and colour, they mirror the randomly individualistic character of the historic plain tile, while avoiding the dull, uniform appearance associated with machine made tiles. Tudor’s ‘conservation peg tiles’ have been specifically designed to complement listed buildings and heritage properties. With their more gentle double camber and meticulous detailing, they are ideal for specialised historical renovation and restoration work. 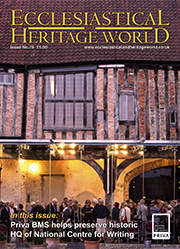 Their warm, subtle tones and slight variation in shape and texture, accurately recreate the aged, time weathered look of the ancient peg tiles of Kent, which have been part of the English architectural landscape since the 13th century. They are available with round or square peg holes to accommodate a variety of wooden pegs. Bespoke sizes and shapes of the tiles, along with the additional option of a single nib on the top edge of the tile ensure that most restoration projects can be undertaken. 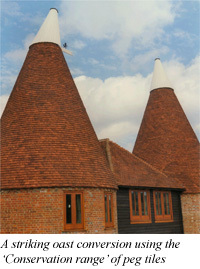 Tudor’s oast tiles, with their essential shaped (tapered) widths, and gentle cambers, help maintain the ‘olde world’ charm and character of the original oast or oast houses - found typically in Kent and Sussex. Dating back to 1750, oast houses, which were originally used for drying hops in preparation for the brewing process, are now being redeveloped for modern day use.